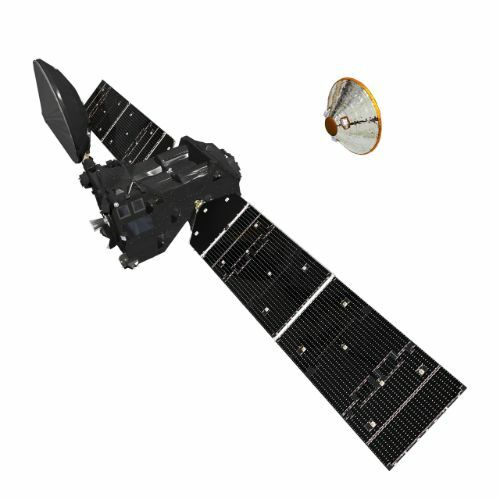 The separation maneuver was not without some nail-biting, though, caused by a an unexpected, but temporary loss of data from the orbiter immediately after the lander was sent on its way. 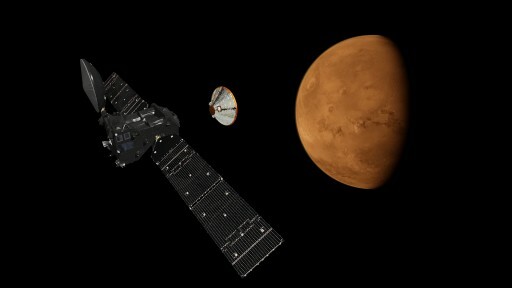 Now on separate paths after a seven-month flight, the two are approaching the culmination of their mission on Wednesday when Schiaparelli could become the first European craft to master a successful landing on Mars and the Trace Gas Orbiter swings into orbit to mark the start of a five-year mission tracking atmospheric gases relevant to life. The Trace Gas Orbiter provided a smooth ride to Schiaparelli, giving the spacecraft a big boost to Mars in July and September before a final course correction on Friday set the duo up to become two separate spacecraft for the final three days to arrival. 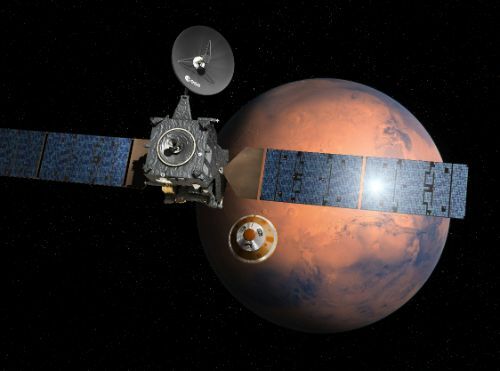 Controllers at the European Space Operations Center closely monitored the 577-Kilogram lander when it powered up on Sunday, showing good temperatures and full batteries in readiness for its plunge toward Mars. 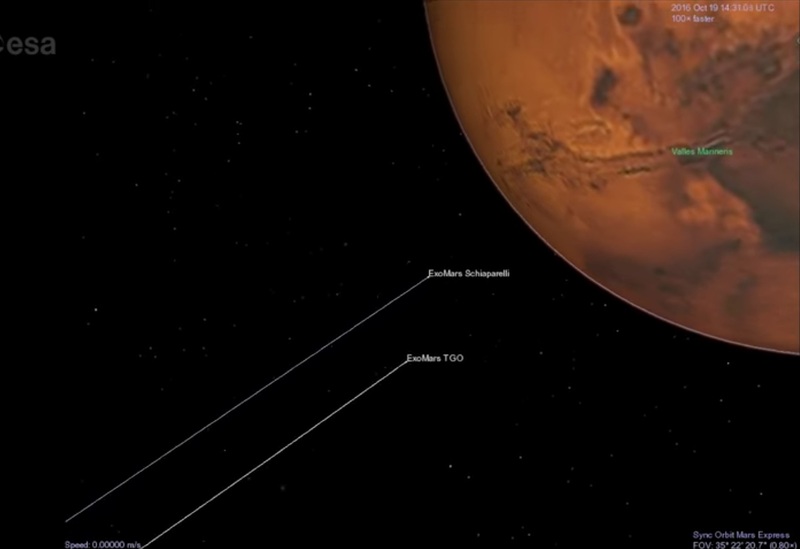 The separation timeline on the lander was activated at 11:25 UTC and the Trace Gas Orbiter began a re-orientation to point to the correct direction for Schiaparelli’s encounter with the Martian Atmosphere. The orbiter then stowed its high gain antenna and locked its solar arrays to be able to deal with the shock occurring at the spring-loaded separation event. 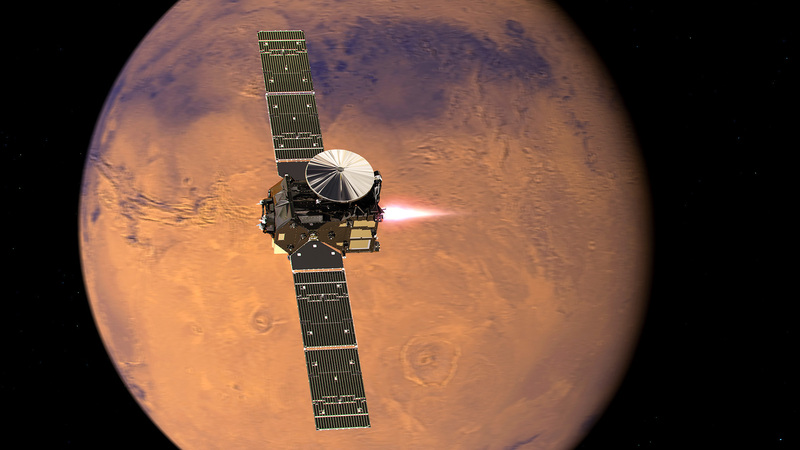 Separation occurred right on time at 14:42 UTC – exactly three days before Schiaparelli encounters the Martian Atmosphere. 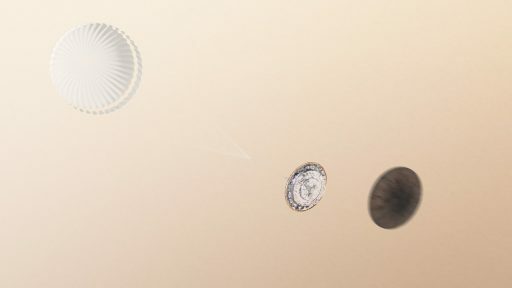 A three-point separation system was designed to push the Schiaparelli lander away at a relative velocity of 0.37 meters per second and, in the process, spin it up to 2.75 rotations per minute for passive orientation stabilization until the atmospheric encounter. Because the high-gain antenna of the Trace Gas Orbiter (TGO) was stowed for the separation, only the craft’s carrier signal was available for teams on the ground to detect the separation through the wobble on the spacecraft caused by the lander being pushed off. Also listening in was the Giant Metrewave Radio Telescope (GMRT) in India that consists of thirty 45-meter radio telescopes and is capable of recording the extremely faint UHF signals coming directly from the lander. GMRT did pick up a faint signal after separation, confirming Schiaparelli had begun its three-day approach to cover the final 800,000 Kilometers to the surface of Mars. Schiaparelli headed into a pre-programmed hibernation mode 15 minutes after release in order to save its non-rechargeable batteries for the brief surface mission. With Schiaparelli on its way, focus at the European Space Operations Center shifted back to the orbiter that was expected to slew back to an Earth pointed attitude and re-initiate high-gain communications at 15:12 UTC. As expected, the signal intensified as the high-gain antenna came on line and the spectral display at mission control showed three pronounced peaks in the radio frequency spectrum. However – to the surprise of the Mission Team – no telemetry was being downlinked by the orbiter and only carrier signals were being received by ESA’s New Norcia ground station in Australia. Diagnosing the issue, teams were under some time pressure as the original mission timeline called for TGO performing a propulsive maneuver exactly 12 hours after lander separation. 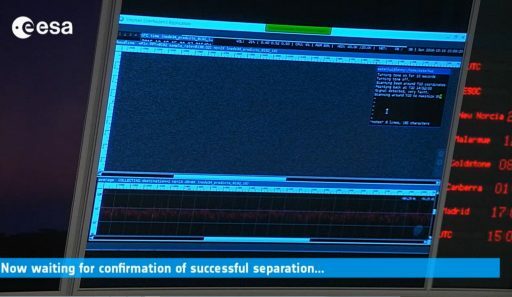 Luckily, teams were able to resolve the issue and telemetry from the lander was restored at around 16:41 UTC, allowing data to be downlinked to further investigate the issue and ensure it will not occur again when the orbiter is closer to Mars. Back on track and communicating through a ground station in Argentina, the Trace Gas Orbiter spent a few quiet hours charging its batteries and maintaining constant communications with ESA’s tracking stations and NASA’s Deep Space Network. The overnight Mars Avoidance Maneuver was a critical step in TGO’s approach to move away from a collision course with the planet and place itself on a flyby trajectory to set up for orbital insertion. Slewing to the proper orientation for the maneuver, TGO arrived in its burn attitude at 2:12 UTC with half an hour to spare. The burn started on time at 2:42 UTC and was programmed to run for a maximum of one minute and 46 seconds, changing the orbiter’s speed by 11.6 meters per second, raising the periapsis altitude from 60 to around 1,300 Kilometers to line the spacecraft up for the Mars Orbit Insertion maneuver. 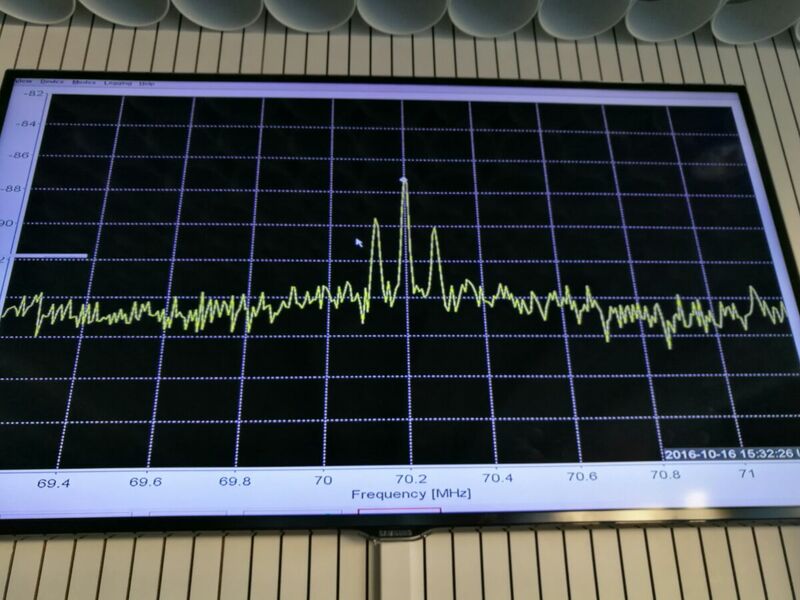 ESA did not follow the burn ‘live’ and had to wait for re-acquisition of TGO’s signal at 3:05 UTC to downlink telemetry gathered during the maneuver – showing excellent burn performance, to be verified through tracking over the course of several hours. Now on two very different trajectories, one intercepting the Martian Atmosphere, the other leading past the planet, TGO and Schiaparelli are set for another two and a half days of approach. For Schiaparelli, no major events will occur until its fast-paced Entry, Descent & Landing Sequence on Wednesday, spending most of its free flight in battery-saving hibernation. The Trace Gas Orbiter, on the other hand, will remain active throughout its final approach and is set to receive its commands for orbital insertion on Wednesday. 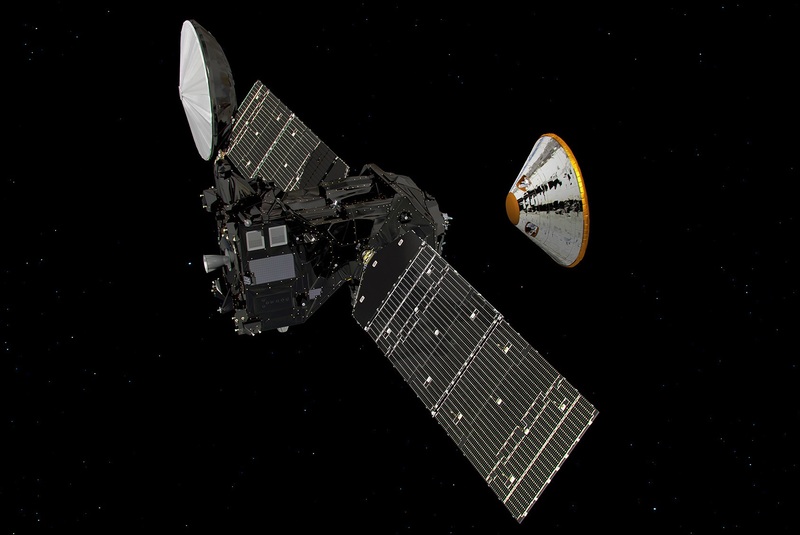 Around three hours after the Mars Avoidance Maneuver, TGO heads into a reconfiguration to a Failop Mode in which the spacecraft will ignore any non-critical spacecraft systems faults to avoid going into safe mode during the crucial Mars Orbit Insertion Sequence. Command uplink for orbital insertion will be completed by 9 UTC on Tuesday. The sequence of events on Wednesday will be relatively fast paced in the twofold adventure at Mars, 175 million Kilometers from Earth. No intervention from Mission Control will be possible as the one-way signal travel time will be 9 minutes and 46 seconds. Schiaparelli will hit the Martian Atmosphere at 14:42 UTC at a speed of 5.8 Kilometers per second, enduring temperatures up to 1,750°C before ejecting its parachute and slowing down prior to a half-minute rocket-powered descent that is designed to bring the Surface Platform to a two-meter free fall to its landing site in Meridiani Planum. The entire sequence from atmospheric entry to touchdown is expected to last just under six minutes. For the TGO team, tensions will last much longer as the orbiter is tasked with an engine burn of 139 minutes starting at 13:05 UTC to slow down in order to be captured in an elongated orbit around Mars. 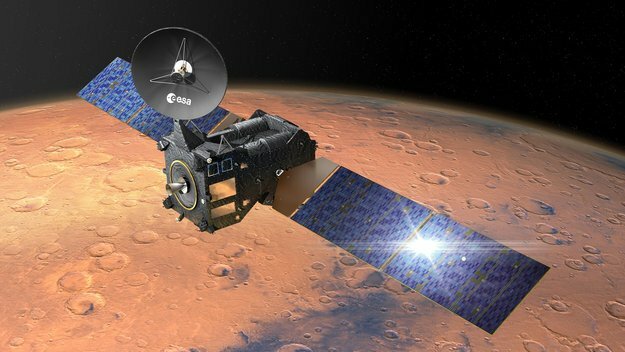 Schiaparelli’s landing will provide the data needed to deliver Europe’s first Mars rover to the surface to fulfill the second half of the ExoMars mission objectives. 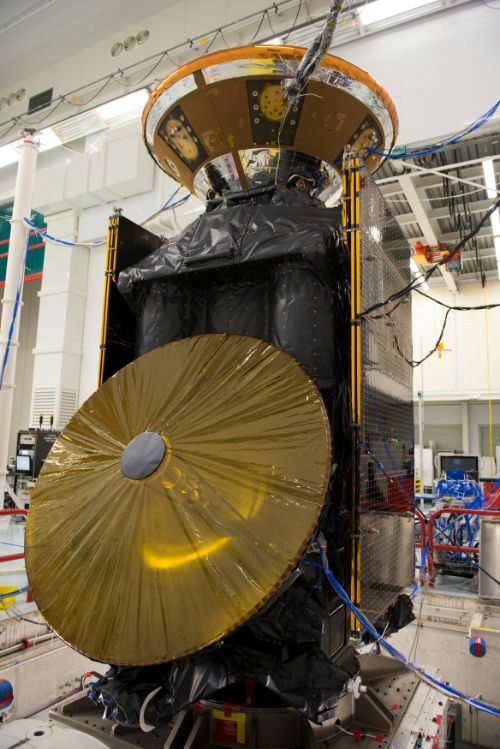 While the orbiter detects atmospheric trace gases that are relevant when assessing the past and present habitability of Mars, the 2020 ExoMars rover will be tasked with the search of possible biosignatures. Landing close to NASA’s Opportunity rover that has been on Mars since 2004, Schiaparelli will survive only four Martian Days using every last bit of power stored in its chemical batteries to capture measurements with an environmental monitoring system, gathering data on meteorological and other parameters.